NoExcusesHR: "You Don't Do Anything Halfway"
Regardless...one thing about me is clear. As a friend recently told me..."you don't do anything halfway." So is this post about my character flaws? Ha! Perhaps. Sometimes being in "go-mode" all the time has it's drawbacks. Although candidly, other than occasional bouts of being tired as heck, I have no idea what they might be. But does "full power" play out in a positive or negative way in the workplace? One business advantage that I believe to my very core is this: those that are willing to take risks and move quickly will dominate the market place. They won't just be competitive...or "in the game." They will BE the game. In effect, the new standard that others will be forced to follow. Speed wins. Risk wins. Extroverts win. Whether that means fighting for talent, positioning their employer brand in the modern (digital) world, or simply making a decision that must be made to move forward. The downside of this personality strength (or flaw?) is the risk of being perceived as the proverbial bull in a china shop. For me, the results far outweigh the risks. The non-stop chatter about getting outside our comfort zones is repeated so frequently because it is true. Playing it safe...trying to be popular at work..and never moving too quickly so as to avoid making any mistakes actually has the reverse effect. Decisions are not made, action is not taken, the competition outmaneuvers you...and not surprisingly you become quite unpopular. Are you still going halfway in your work? Why? 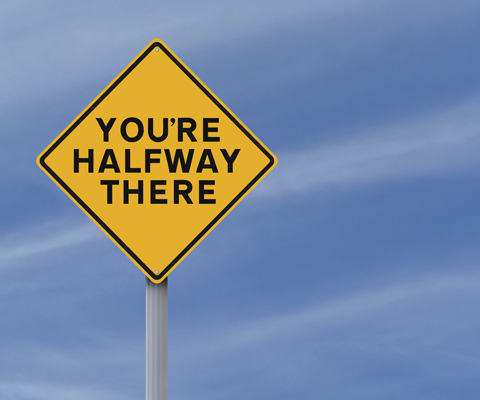 Does your company's strategic plan call for a halfway executed approach? Is filling your vacancies halfway sending a good message to your team? If so...you're probably only halfway effective...and halfway popular too.